If you dread going on long car trips with kids, then, well, don’t! There are lots of ways to make it the best time for you and the whole family. You can look at it as an opportunity to connect with your children and enjoy each other’s company. A few family car games and activities described in this post can help enhance some important life skills of your children, like concentration, communication, language development and creative thinking. Yet, the best part is they can help you to have a simply amazing family time. Tell a story to your child that she knows very well. For instance, describe the day you and your spouse have met, the day your child was born, or how you have chosen her name. As you tell, add a few more “details” she didn’t know about (such as “…and when we saw each other, a big tiger appeared from nowhere, and spoke to us….”). Be prepared for a lot of giggles and very unusual turns of events when your child decides to help you finish your silly stories. Name an object, and ask your child to show you if he can eat it or not. For-example, if you say “an apple”, you child rubs his tummy, and if you say “a truck”, he pretends that he is pushing away the meal. The game is fun, simple and can bring a lot of laughter on your trip. The smallest members of your family might find it especially enjoyable. Start the game with: “I spy with my little eye something…” and finish it by giving a clue of what you spy (like a letter it starts from or a color of it). It can be anything or anyone in a car. Take turns to spy. This simple and easy-to-learn game can keep your child occupied for a surprisingly long time. 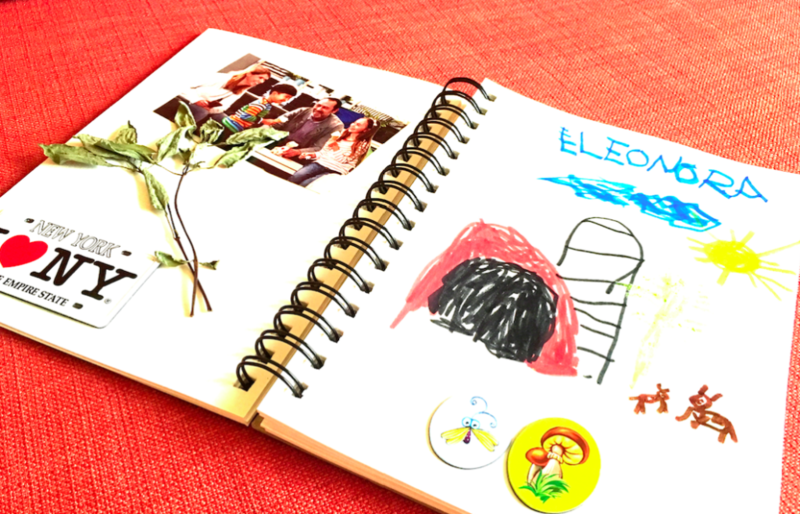 Offer to your child the opportunity to become a real explorer and write a travel journal during your trip. You need a notepad, some crayons or washable markers and a glue stick. If a child doesn’t know how to write, he can draw the things that he sees around – an unusual vehicle, a bird or a river. You can leave a few empty pages in the journal for a receipt from a restaurant on the way, a leaf picked up somewhere during a stop or some printed family pictures. Good old classic game, just like “I Spy”. Think of a place, a person or a thing, and invite everyone take turns trying to find out what you are thinking about. All they need to do is to ask you “yes” or “no” questions until someone guesses right. Checklist is an awesome game, which you have to prepare at home before your trip. Take a piece of construction paper and draw in some squares. 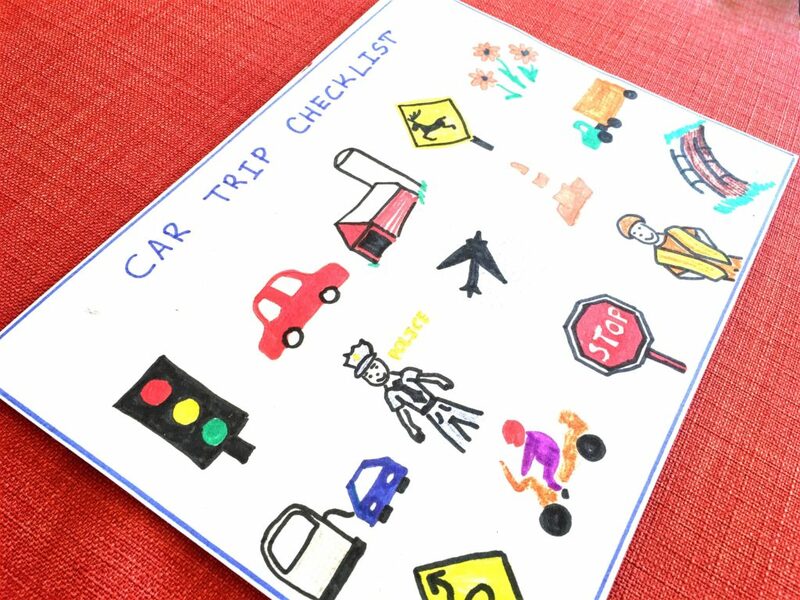 Think of the things you will most likely see during your trip, such as a big track, a red car, a bridge, a gas station, a policeman, a motorcycle and draw the pictures of them in the squares. You can use stickers too. During the trip, hand the checklist to your child, and ask her to watch attentively everything in the window and mark the things she can find. Where Is That Car Going? Look at the window, spot an interesting vehicle and ask your child where does he think it is going? Make up some stories together, such as a grandma, who works at a candy factory, visiting her grandchildren or a firefighter coming back from work. For older children you can make this game educational and try to figure out if a car in front of you is going toward or away from the state by looking at the state on the car’s license plate. Find an easy word to rhyme, like “a cat” or “a nose” and just start rhyming with your kid. You will be surprised to see how entertaining this simple game can be. Don’t worry if instead of a perfect rhyming words your child starts making up something funny but senseless. This game is a very good exercise for language development. Those meaningless variations of the real words your child will enjoy so much, are part of this exercise. 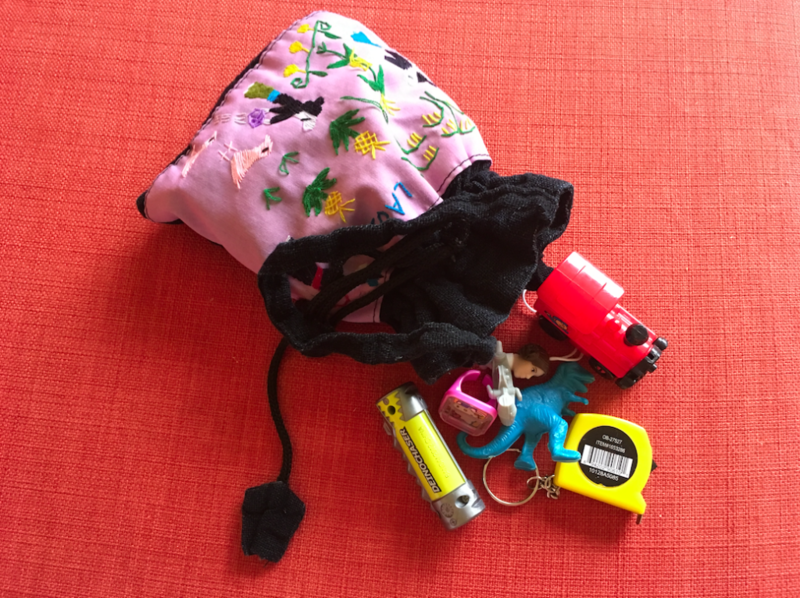 Collect some small toys in a little non-transparent bag before your journey. A bag itself might occupy your child’s attention for a long time. But before giving it to her for the rest of the trip, play a game. Ask your child to put her hand inside of the bag and without looking tell you what she thinks she is holding there. Trying to recognize the toy by touch can be puzzling, but definitely fun. Even some old, well-known toys become magical in this bag. Randomly pick up a letter and start saying words that start with this letter. After your child understands the rules, offer him to do the same. You can take turns finding the words on the same letter. The one, who can find more words, wins. And here is a little bonus for your car trip – the Silence Game. The rules are easy: the one who speaks first, losses. Don’t count on half an hour of science though, may be a few minutes at most. Just enough time to close your eyes, take a deep breath and think what an awesome family you have!